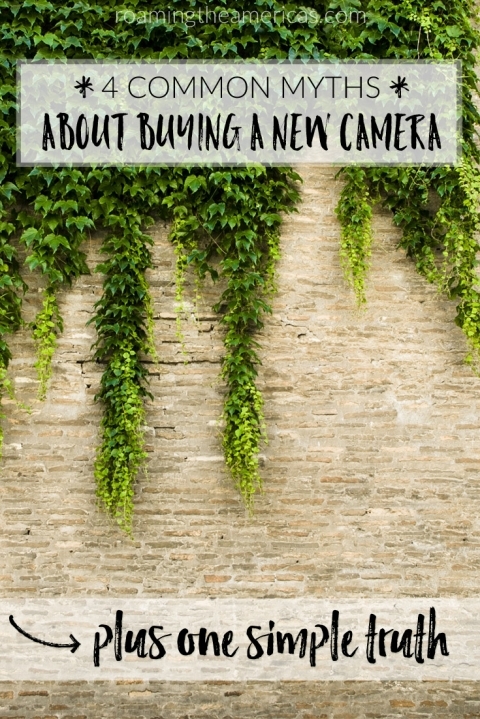 If there’s one question I get asked more than any other, it’s this: Which camera should I buy? Or sometimes, What’s the best camera for sports/everyday/family/travel photography? And I get it–if you’re anything like me, hundreds (or thousands) of dollars isn’t pocket change, and you want to make the right choice. So I want to clear up a few myths that I’ve heard floating around and then share ONE thing that should inform your decision about which camera to buy. I need to get a camera with interchangeable lenses and lots of modes (so I can take amazing photos). ___________ brand is the best (at taking amazing photos). I need to spend thousands of dollars on a camera (so I can take amazing photos). Okay, so I’m dropping some hints on what I actually think about all this…But before I share the one thing that I think is most important, I want to let you know that it’s not your fault if you’ve thought any of these things (I know I’ve thought them all in the past!). Don’t feel bad for having said or asked or believed any of them. It’s EASY to believe all these things because camera companies are marketing their products to us. They want you to think that you need the biggest, newest, most expensive cameras in order to learn photography and take amazing photographs. But it’s just not true. So what’s the truth? The truth is that the camera is just a TOOL to help you tell a story, and it won’t make you a better photographer. What WILL help you take better photos and become a better photographer? Learning basic concepts (the exposure triangle) will help you use whatever tool you have at your disposal because you’ll see that every camera works the same (whether it’s a smart phone, film, point-and-shoot, mirrorless, or expensive dSLR). The same fundamentals of light and composition apply with any camera. You might not have any clue about what all this theoretical talk about light means right now, and that’s perfectly okay. The important thing to remember is that you are the photographer (not your camera!) and a specific brand or camera model won’t make you a better photographer–it takes learning and practicing the basics, and it’s a journey. Umm…that’s great, Naomi. But I still don’t know which camera to buy. I know that when you’re investing your money into something, you want to make a wise decision. It is true that some tools are better than others, so it’s important to do research. I’m 100% the same way, and I usually agonize over these decisions. But now that you know that you are the photographer and not your camera, I want to help you find that camera that fits your needs and that you can grow with. Every photographer has different needs and preferences. I created an interactive e-workbook to help you take the guesswork out of finding the best camera for your needs. It doesn’t just give you specific camera recommendations or a generic list of all the “best” cameras, but it walks you through the practical questions you need to ask to help you confidently choose your perfect camera–in an organized, 3-step approach. Check out the Complete Camera Buying Guide for Aspiring Photographers here! David duChemin is a photographer who helped inspire these ideas for me in my journey as a photographer. His ideas about craft (the techy, geeky side of photography) and vision (the story you want to tell) have informed a lot of my thinking about photography. He shares a lot on his blog, and his book Within the Frame (affiliate link) is one of my favorites and highly recommended for photographers who already have a grasp on photography fundamentals and want to develop more as a photographer.